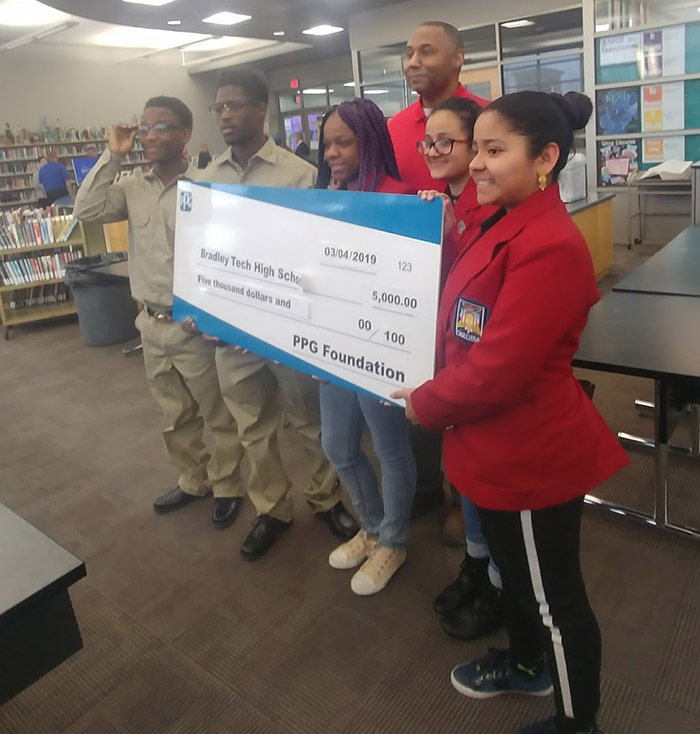 PPG Industries has presented the Bradley Tech SkillsUSA Chapter a check for $5,000 on behalf of the PPG Foundation. Each year, PPG and its staff from of the Industrial Coatings Division, located in Oak Creek, sponsor our STEM and after-school enrichment programs. Mentors have assisted our Build motorcycle club, and they provide judges for our SKillsUSA meets. In addition, PPG has helped fund the purchase of equipment in our Maker Space and our FabLab shop, where students can quickly design and prototype their engineering inventions using a CNC router, a laser cutter, and 3-D printer. This year’s PPG grant will assist the 30 students and staff who have been competing in SkillsUSA meets at UW-Stout, Gateway Technical College, and Northcentral Technical College, located in Wausau. BT will be heading to the SkillsUSA state meet in April, with competitors in machine tooling, welding, construction, job demonstration, and other career-building skill competitions.